This week has been a week. Not a terrible week, but not a great one, either. It started out great with a super-productive Monday, but on Monday night our refrigerator started making unhealthy noises and, sure enough, by Tuesday morning everything had begun to melt and thaw. So that was tons of fun to deal with. I also had a lot of freelance writing that I needed to clear off my plate, and I’ve been feeling pretty run down all week, to boot. I kept telling myself that it was just allergies and that I just needed to press on, but today I’m throwing in the towel and admitting that I’m actually sick. It’s not all as bad as it sounds, though. For one thing, seeing as how we’re renters now, this refrigerator thing is just a minor annoyance rather than the full-blown crisis it would have been when we were homeowners. And we still have our old fridge in storage downstairs, which we were already using for overflow (our apartment fridge was pretty small), so we just had to tote all our food down there. The replacement fridge won’t arrive for another two weeks, and having to run up and down the stairs all the time to get our food is less than convenient, but I’m just thankful that that’s the biggest thing we’ve got to worry about in this situation. 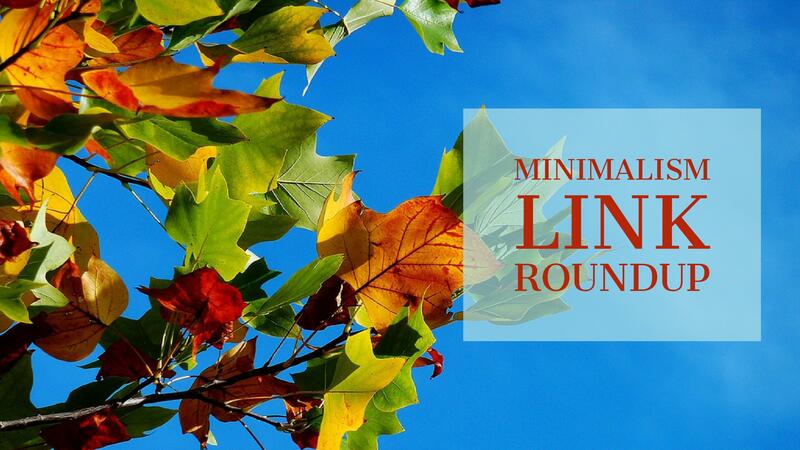 At any rate, I had a thoughtful post all planned out for this week, but here are some links relating to minimalism and simple living instead, because keeping it simple is all I’ve got the energy for. A new phase of Project 333 begins in October, and I’m hopping on the train–or trying to board, at any rate. If you don’t know what that is, the short version is that it’s a capsule wardrobe challenge in which you try to live with just 33 pieces (including shoes, jewelry and accessories; workout clothes, lounging-around-the-house clothes, sleepwear and underwear don’t count) for three months. I spent this morning cleaning out my closet and figuring out my fall capsule wardrobe and managed to get it down to 42 items, but I’ve still got a week left to decide what else to eliminate. This is a good post by Joshua Becker examining whether a good criteria for deciding what to keep or discard from your life is whether or not it “sparks joy.” I have thoughts and opinions about his thoughts and opinions regarding the Konmari method, and that was originally going to comprise this week’s post. But I couldn’t muster the energy to write about it coherently, which is why now you’re getting links. But his post is worth a read. Finally, you probably already know about Emily P. Freeman’s new podcast, The Next Right Thing, but I thought I should mention it just in case you missed it. This short podcast — each episode is only about 15 to 20 minutes long — is meant to help “create a little space for your soul to breathe so you can discern your next right thing in love,” and it’s so, so encouraging and inspiring. If you struggle with overwhelm and decision paralysis, this, my friend, is the podcast for you. Do you have any relevant links or recommendations you’d like to share? Be sure to leave them in the comments! And let me know if you want to tackle Project 333 with me, too. Meanwhile, I’m going to spend the weekend with my feet up, reading and watching Netflix in between naps and drinking copious amounts of Throat Coat tea. I haven’t been thinking of doing Project 333, but I *have* been thinking it would be nice to wear a uniform. What would happen if I wore my black dress to work each day? Would anybody care? Would I? I’m going to check out your link. I’m not sure I’m ready to jump in, but I can maybe pare down my closet. I’ve adopted the Lazy Genius’ idea of a Monday uniform (for the Fall season it’s jeans and my sparkly pumpkin t-shirt), and just not having to think about what to wear on Mondays is a load off. Of course, the rest of the days it’s usually some jeans/top or t-shirt combo, which is almost like a uniform. It doesn’t take much thought. I want to wear a sparkly pumpkin t-shirt. 🙂 At home, I usually wear yoga or sweat pants and a t-shirt. Maybe I should jazz it up a little. They’re so comfy though. I went through my closet this weekend, pulling my clothes out of the closet and trying them on like Project 333 recommends. I filled a garbage bag with donations, and I also discovered the summer clothes I put away over a year ago actually fit, and I could have worn them this summer. Next year. Thanks for writing about P333, because I otherwise wouldn’t have tried them on. \o/ Woo! Go team Becky! That’s great! I’m probably going to write more about it soon. I filled two grocery bags with stuff to give away, and I think it’s going to be useful as a filter to figure out what else I really don’t like to wear deep down. If I keep doing this and something keeps not making the cut for reasons other than seasonal inappropriateness, then I’ll know it’s time to give it away.